Search below for wonderful places to visit donkeys in Italy, from donkey sanctuaries and rescue centres to farms and nature reserves. Loreto Aprutino. Educational and recreational enrichment programs for children, including petting, brushing and cuddling donkeys, interactive activities, thematic workshops, story telling and acting. Aria Aperta Asineria Reggio Emilia. Planned activities with donkeys including hiking and educational visits. We are on the outskirts of Reggio Emilia green city, full of parks and natural areas near the city walls. San Vito di Fagagna, Udine. Entertainment and educational projects for children, donkey trekking, donkey training courses and assisted activities with donkeys run by Dr. Erica Franzil, specializing in school learning disorders and animal assisted interventions. Asini dell’Arca del Seprio Vedano Olona. Therapeutic and educational walks with donkeys through Pineta Park. Recanati, Macerata. Ca’di Luna è una piccola proprietà contadina e asineria, sotto il colle dell’infinito di Leopardi. Terapia assistita con l’asino, escursioni con asini, campi estivi, esplorare il bosco tra animali selvatici e folletti e coltivare l’orto e laboratori artistici e culturali. Assisted therapy, excursions, camping and workshops. Asino Felice Cigliano, Vercelli. Trekking someggiato. Camminare con l’asino è un’esperienza rilassante ed educativa che fa bene allo mente e al corpo di chi cammina. Gallura. 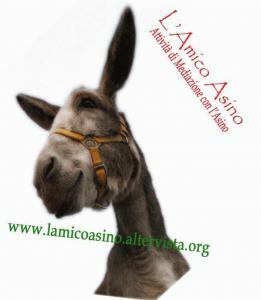 Associazione culturale, tutela e valorizzazione dell’asino. Attività Assistita con gli Asini, attività ludico-ricreative, onotrekking. Località Punta d’Acu, Arzachena. Ranch Margherita Meleto Valdarno, Arezzo. Cavriglia Park is set in 600 hectares of lush, unspoiled forest on the Chianti Mountain range. There are camping facilities, parks and a hotel and restaurant. The ranch runs activities for families and schools, summer camps, hikes, exhibitions, work with the disabled, private parties, training and education. Fattoria Didattica La Serra Crespina. The Educational Farm La Serra is situated in Tuscany, near to Pisa and Livorno. We conduct workshops and educational courses, involving children in different activities that allow them to develop their sensory pathways and learn through direct observation and manipulation. La Fattoria Didattica La Serra ti dá il benvenuto. Noi che viviamo qui siamo innamorati dei nostri boschi, dei prati, dei campi e vorremmo condividere con voi la spettacolarità della natura che ci circonda. Associazione Asino a Chi Ceppiaano, Crispina Lorenzana, Pisa. Educational activities, assisted therapy, summer camps for children, pet therapy and onotherapy courses in collaboration with the educational farm, La Serra.